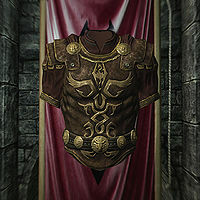 General Tullius' Armor is the armor used by the eponymous General Tullius. The most distinguishing trait of this item is its appearance, with its gold trim and the ornate Imperial Legion symbols on it distinguish its owner as one of the highest ranking members of the Legion. The defensive capabilities of this armor can be improved at a workbench with a steel ingot. This item is classified as clothing, but is also considered to be heavy armor.